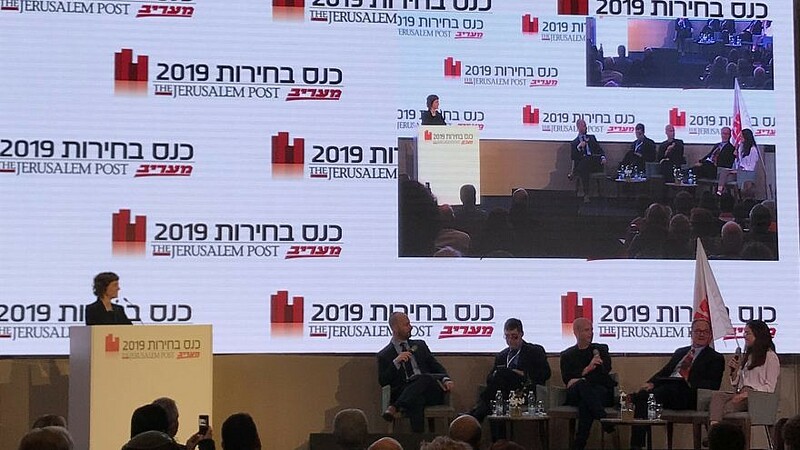 (April 4, 2019 / JNS) The not-so-packed Jerusalem Post 2019 Elections Conference held at the InterContinental David Tel Aviv hotel attracted mostly older people interested in hearing representatives of each political party outline their platform ahead of next week’s elections. While no candidate said anything substantially new, what made the conference attention-grabbing were some pointed questions by the panel, off-the-cuff answers by the candidates and even catcalls from the audience. Avi Nissenkorn, chairman of the Histadrut labor union, is a candidate for the 21st Knesset for the Israel Resilience Party, as part of the Blue and White list. Feiglin was asked by senior Ma’ariv analyst Ben Caspit whom he would recommend to the president to form the government, to which Feiglin replied that he doesn’t yet know. Feiglin, along with another center-right party Kulanu, headed by former Finance Minister Moshe Kahlon, has left open the possibility that they might join a coalition headed by the Blue and White Party. According to a recent survey conducted by the Guttman Center at the Israel Democracy Institute, 42.5 percent of Israelis favor a government headed by Prime Minister Benjamin Netanyahu, while 40.5 percent favor a government headed by former IDF Chief of Staff Benny Gantz. Analysis by age reveals that the preference for Gantz is greater among those aged 45 and over, while preference for Netanyahu is greater among younger voters.